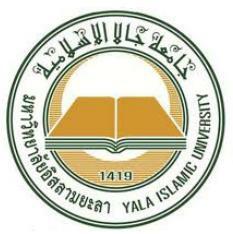 Yala Islamic University is a private institution that aims. As a source of knowledge on Islam and other subjects. Graduates in subjects that meet the needs of society. Graduates from college with a focus on morality and ethics must be a good role model for society. A better understanding. Unity Cooperation between people in the nation. And solve problems by peaceful means.